DAVID BOWIE LEGACY, which will be released on Nov. 11, collects together some of Bowie’s finest singles from his first hit, 1969’s “Space Oddity” through to the final singles “Lazarus” and “I Can’t Give Everything Away” from earlier this year. All formats of DAVID BOWIE LEGACY feature a previously unreleased version of the classic 1971 single “Life On Mars?” mixed by its original producer Ken Scott. In over 50 years from his very first recordings right through to his last album Blackstar, David Bowie was at the vanguard of contemporary culture as a musician, artist, icon and a constant influence on generations of writers, artists and designers. He was, and remains to be, a unique presence in contemporary culture. See the full release to learn more about the collection. CBOE Holdings Inc. and Bats Global Markets Inc. announced on Sept. 26 that they have entered into a definitive agreement, which has been approved by the board of directors of each company by unanimous votes of the members of the boards present, under which CBOE Holdings has agreed to acquire Bats in a cash and stock transaction valued at approximately $32.50 per Bats share, or a total of approximately $3.2 billion, consisting of 31% cash and 69% CBOE Holdings stock, based on CBOE Holdings’ closing stock price of $70.30 per share on Sept. 23. See the full release to learn more about CBOE’s acquisition of Bats. Astronomers using NASA’s Hubble Space Telescope said they have imaged what may be water vapor plumes erupting off the surface of Jupiter’s moon Europa. This finding bolsters other Hubble observations suggesting the icy moon erupts with high altitude water vapor plumes. The observation increases the possibility that missions to Europa may be able to sample Europa’s ocean without having to drill through miles of ice. See the full release to learn more about the discovery. In light of the number of new businesses in the U.S. reaching record highs since the financial crisis, GOBankingRates has ranked all 50 U.S. states to find the best and worst states to start a business. GOBankingRates analyzed the following factors: startup activity; business survival rate; productivity; availability of employees; education level of potential employees; business tax climate; and cost of living. See the full release to learn where your state ranks. Nissan on Sept. 27 unveiled its latest video showcasing innovations designed to bring the benefits of its intelligent mobility technology to the daily lives of customers. 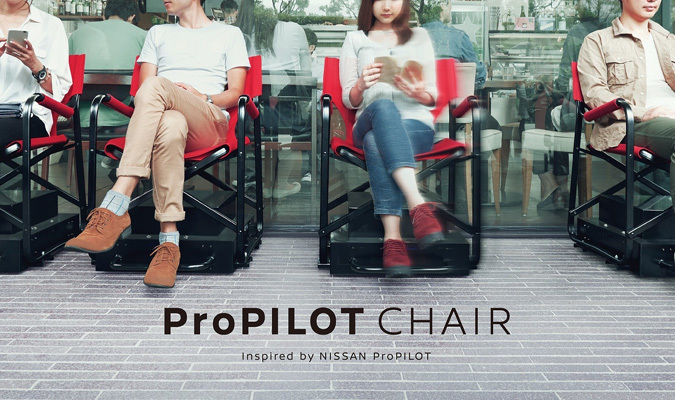 Following the success of the Intelligent Parking Chair earlier this year, the new “ProPILOT Chair” automatically queues on behalf of its occupant, sparing them the hassle of standing in line. See the full release to learn more about the chair.